By Nels Dzyre in Mobile. Updated on January 5, 2015 . 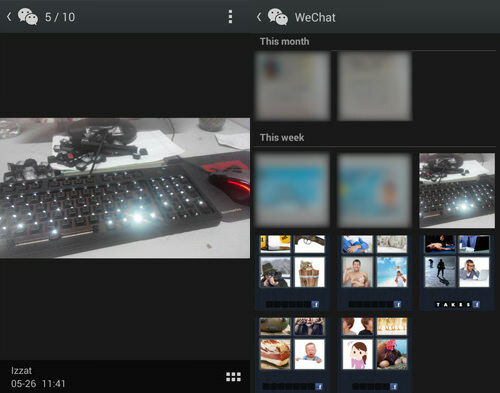 One of the reasons why people sometimes prefer WeChat over Whatsapp or Viber is that WeChat has some interesting features that some people find convenient, fun and cool. They have a feature called Moments, a place where you can share photos, video or just a simple status update just like Facebook timeline. They also can be used from within a web browser on your desktop. We have previously published WeChat tips and tricks (you might want to start with that post first) and this round, we have collected 10 more tips and tricks to get more out of WeChat. Note: These tips and tricks were tested on an Android device. The steps may differ for iPhone user. 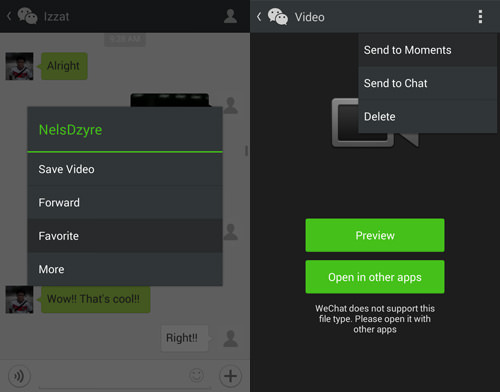 Sharing video on WeChat is fairly easy but for some reason sharing videos on Moments is not available yet. However, there is a trick for you to share your uploaded video and send it to Moments. Enter any chat room and click on the + sign at the bottom, then tap on Video. Select to either Take Video to record a new video, or Choose Video to retrieve one that is already on your device. Once the video is uploaded, do a long press on the video in the chat room and choose Favorite. 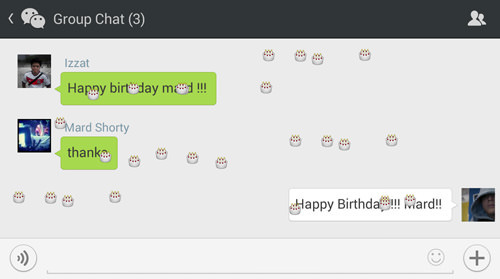 Now go to the WeChat main page and tap on the navicon and choose Favorite Messages. In there, tap on the video you have just favorited then tap on the navicon and choose Send to Moments. Fill the blank with your a message, and tap on Send. 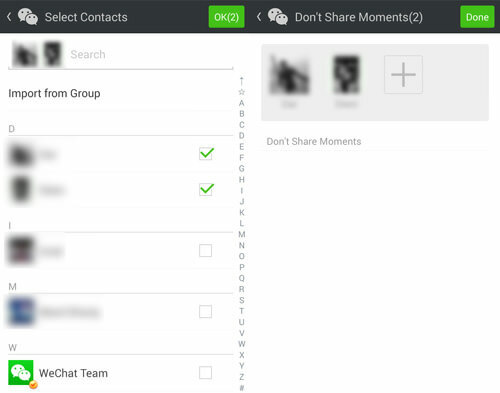 When updating your Moments, you can also choose to whom, or which group fo friends, you want to share that Moment with. Go to Discover > Moments. Tap on the Camera icon on the top right and select to Take Photo or Choose Photo on your device. Tap on Share to… and tap on My Groups in the Sharing page. Tap on New group… and tick the name of your friends that you want to allow to see the photo update. Tap on Name then name your Group and tap on Save. Next tap on Done. Go back to the Sharing Page and tick your newly created group and go back to your Moments update page. 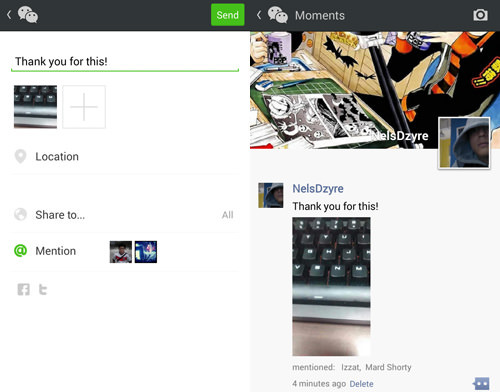 Complete your Moments update and tap on Send. 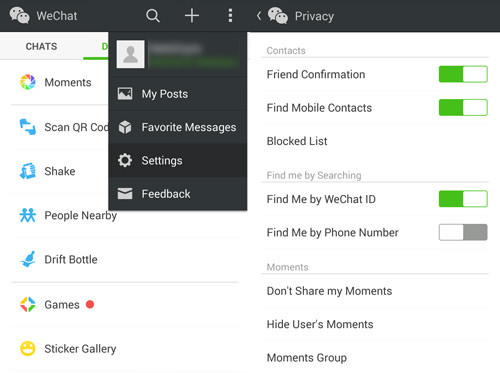 Go to the WeChat app main page and tap on the navicon and choose Settings. Tap on Privacy and then tap on Don’t Share my Moments. Tap on the + sign and tick friends that you don’t want to see your Moments; tap on OK. In the next page tap on Done. Like tagging friends on Facebook, you can also Mention friends on photo updates you release in Moments. Go to Discover > Moments and tap once on the Camera icon at the top right. Select Take Photo if you want to snap a new picture or Choose Photo if you want to share the photo that is already in your device. In the status page, tap on Mention and tick friends you want to tag. Tap on Send to update your Moments. When in a group conversation, @ pulls up the list of names of friends who are in the same chat group. This way, you can quickly choose who you want to mention just by picking the name from the listed suggested names. In any group chat, type @ in the message box. You will be prompted with a new window asking you to select which friend that you want to tag. Choose your friend by tapping on their name. If you haven’t noticed yet, certain keywords you use in chats may trigger Confetti that will fall from the top of your chat screen in your chat room. Everyone in the chat room will be able to see the Confetti if someone type a keyword that triggers it. Below are some of the keywords that you can use to trigger Confetti in chat room but do take note that some of these keywords have special time periods and may expire. By default, anyone that has your phone number saved as one of their contacts on their phone will be able to look for you on WeChat. If you want to disable this feature, here’s how. 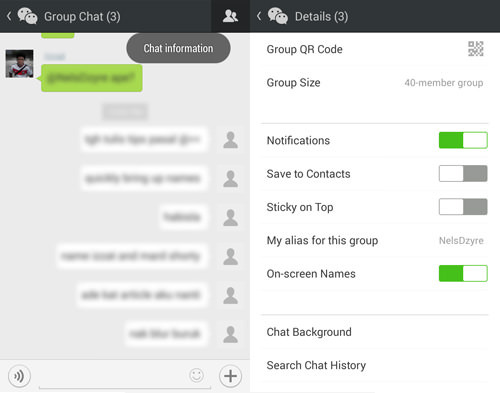 Tap on the navicon and choose Settings in the main page of WeChat app. Tap on Privacy then tap on Find Me by Phone Number to disable it. Need to mute your chat notifications? Here’s how. Enter any chat and tap on the chat information icon at the top right. Look for Notifications and tap on it to disable. Alternatively, you can choose when these notifications can come in (check out the next tip). There’s an option in WeChat that allows you to set the start and end time of when you can receive WeChat notifications. For instance, if you want peace of mine at the office, or when you are asleep, you can set your Notification Timing to be deactivated at certain periods. 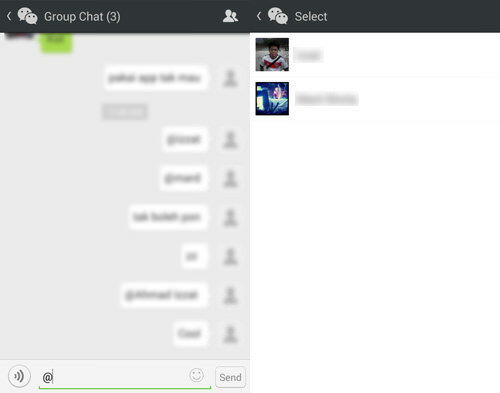 Go to the WeChat app main page and tap on the navicon > Settings > Notifications > Notification Timing. Tap on All Day to disable. Then tap on Start. Set the Start time you want to receive notification then tap on Done. Next tap on End to set the time when you want to stop receiving notifications. Then tap on Done.